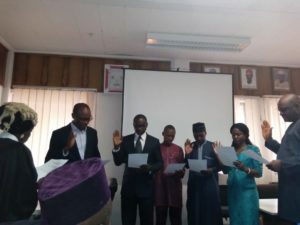 The key role the National Salaries, Incomes and Wages Commission (NSIWC) has to play in ensuring an effective public service for Nigeria has been stressed by the Independent Corrupt Practices and Other Related Offences Commission (ICPC). This formed part of the charge given by the Acting Chairman of ICPC, Dr. Musa Usman Abubakar, at the inauguration and induction ceremony of members of the Anti-Corruption and Transparency Unit (ACTU) of the NSIWC recently. Dr. Abubakar who was represented at the event by Mr. Kupolati Kayode of Corruption Monitoring and Evaluation Department of ICPC said the NSIWC’s “mandate which involves the review and putting in place, a sustainable remuneration system for public servants” was crucial to the efficiency and effectiveness of the public service. He noted the NSWIC’s vision of being the “hub for the determination of a realistic compensation system in the Nigerian economy requires that the agency has personnel who are transparent and live above board”. Dr. Abubakar also underscored the need for the agency to adhere to operational guidelines and extant rules in its processes, failing which it could not ensure effective service delivery in line with its mandate. He therefore called on the management of NSIWC to provide a conducive environment for the ACTU to function through the provision of adequate funding for its operations, office accommodation, etc., while advising the ACTU members to work hard and endeavour to stay on the path of integrity. “Be responsible in the exercise of your functions and avoid any oppressive acts given the strategic role you play,” he said. Earlier in his welcome address, the Executive Chairman of the Commission, Chief Richard Egbule who was represented by the Acting Secretary to the Commission, Engr. David Nyikyaa expressed the hope that the new ACTU members would carry out their mandate with every sense of integrity and accountability to achieve a corruption-free working environment.